What Industries Use The Most Temp Employees? Personnel Plus employment agency is dedicated to fulﬁlling our clients stafﬁng needs with employees that are qualiﬁed and reliable in the shortest time possible. We pride ourselves in our work ethic and the ability to ﬁnd the right person for the right job. We are committed to helping our client companies get stronger, one employee at a time. Many qualified applicants are looking for day labor in Anchorage, AL, as well as skilled executive roles. 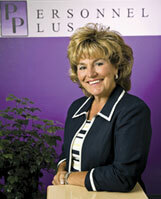 Personnel Plus is proudly celebrating over 25 years of stafﬁng employers with qualiﬁed employees! Personnel Plus is a woman-owned company with an experienced staff committed to providing the best service to clients and applicants alike. © Personnel Plus , Inc. all rights reserved. All other trademarks are the property of their respective owners.